WTF?! Im converting to kitty litter. I am furious. I still dont know if any of my sticks are ruined and probably wont know until i smoke one of them. I get home today, noticed my RH on my humi had dropped from its usual 61-62 down to about 59. I figure its been about a month since i serviced the Gel beads i have (I know you guys are against all of that ) but it worked for me and i figured what the hell, im just a beginner anyways. Anyways, on to the point.. I looked at the gel beads, and they have mold growing on them. I am using Monster Magma gel beads, with Monster Venom. Both are advertised to prevent growth of mold AND THERE IS FREAKING MOLD GROWING ON THEM!!!!! Should i trash the humi and start over ? is there mold on anything else?cigars, humi wood, etc. by chance did you find any spot in the humi that was extremely damp or moist? Couldn't find any mold in the humi anywhere other than on the beads. Humi is a 150 ct. And I didn't find any really moist spots. The gel beads are in a plastic cannister about the size of a beanie weenie can (thats the only relation I can think of ). And i just moisten them with monster venom about once a month and it has been keeping my RH at about 61-62 steady for the past 3 or 4 months. there is mold on the beads and your humi is in the 61-62 range? something seems a little odd with that right? 1) move your cigars to ziplock bags or tupperware containers, be sure to inspect them first, and be sure to fill whatever containers you use to a full as possible, that way the RH will maintain itself for a few days at least. i went through the same thing a few months back. Just started using Humicare gel and mold in two humis and on some very nice sticks. Made me sick to my stomach. All in all, about 150 sticks in the humidifiers. i have never, ever had issues before the gel. I moved all into zip locs, wiped off the mold from the selected sticks that had it, put those into a separate zip loc, and smoked them. They were fine. Do a search for mold on here. I had an issue years ago before I discovered beads. I want to say i wiped down the inside of my humi with a vinegar/water mixture to kill the spores. There can still be spores in there even if you don't see them. It's been a long time since I had to deal with this, so I can't remember everything. So like I said, do a search - there should be tons of good info/advice on dealing with this buried in here somewhere. And everything is definitely not lost!!! You'll be fine if you nip it in the bud and switch over to beads. I had a little black mold on my gel bead jar a while back. Seems to happen a lot. Tossed it and use beads. Here's the good news...a lot of cigar people will store their cigars as low as 59% RH and some a bit higher. The rest of the boys are telling you what you need to do right now...take all of them out..inspect what you have to ensure there is not mold on them and even if there is some slight mold you can wipe it off with a moist paper towel and if there is mold at the foot...start cutting back on it til you don't see anymore. Get a tupperware to store what you have and put some cedar on the bottom or just start putting cigars in old cigar boxes and put it inside the tupperador and then fill the rest of the tupperware with your cigars. You mentioned switching to KL...I applaud you for that because I have 30 humidors of all types and use KL in every single one with great success. I figure you already know how to set KL up and once you've converted and have your RH where you like it then you can sit back and relax. I used to use the Gel and hated it for the exact reason you gave...there was mold growing on the beads and I've used the other brand as well...they got all slimy and then started giving off a stench...I threw those out and went to KL and never looked back and it's been almost 3 years now. Thanks for all the help. Cigars are in zip locks with boveda and water pillows for now. What type of kitty litter do I use? IMO I would ditch the Water Pillows if youre are storing for more then a week or two...... Ive seen those mold up pretty well. Boveda and RH Beads (Heartfelt type) are two way... Kitty Litter, Gels, Water Pillows are not. I do use KL..... 3 LBs in the Winador.... but I still have 10 Boveda in there.... Rock Solid at 67 top and 69 Bottom. I am switching to Heartfelt because of space issues. +1 I have a 2 cubic footer that is airtight, 2lbs of kl holding 67rh going on 3mo without any maintenance. I have about 3 or 4 lbs of this same stuff in my tower. And it is locked down rock solid! Do it! I used the gel for close to 2 years. Thought all the continuous tweaking to either bring humidity down or up was normal, which it is with gel. Since I've gone to litter all I do is add a little water when it gets down below 65. Butforthe most part it stays pegged right at my preferred RH of 68. In my 300 count I just had to give up space for 3 cigars for the extra litter so it would last longer. Converted everything over the long weekend and here it is wednesday and looking at my hydrometer i have a steady RH of 62 in my close to full 150 ct. humi. Not too bad Thanks for all of your help guys . Need some clarification.... You salt tested your hygro.............and now it reads 72. Is this the "adjusted" accurate reading? Anyways, I'll assume this is the case and you know you hygrometer and your RH is in fact at 72, which is too high. You are going to use 3 of these containers for your humi, the other two are "back-ups" (see below). Put two of the containers with the silica from your humi, back into your humi. Put the other two oven treated units into a large zip-lock bag, and vacuum seal it as best you can. Then put that bag in another zip-lock back, and repeat. (These are your back-up adjustment units). Wait 24 hours, and check your hygrometer. If it has dropped a few points, do nothing, and wait another 24 hours, and check it again. If the RH hasn't dropped, replace the adjustment unit with a back-up adjustment unit, and check again in 24 hours. Anyways, you can see where I'm going with this. You want to have one adjustment unit, that will be the container you use to raise or lower your RH. Eventually, over a period of weeks, you'll have "trained" your KL, and you'll have to fiddle with it less and less. BTW, I have used this system on a very large cooler, and multiple humis with great results, for over a year and a half now.......no issues. This seems like a really sound plan. I've never had to "bake" any of my kitty litter (even though I live in the humid south) but I'd definitely follow this plan if I needed to make any adjustments towards the drier side of things. 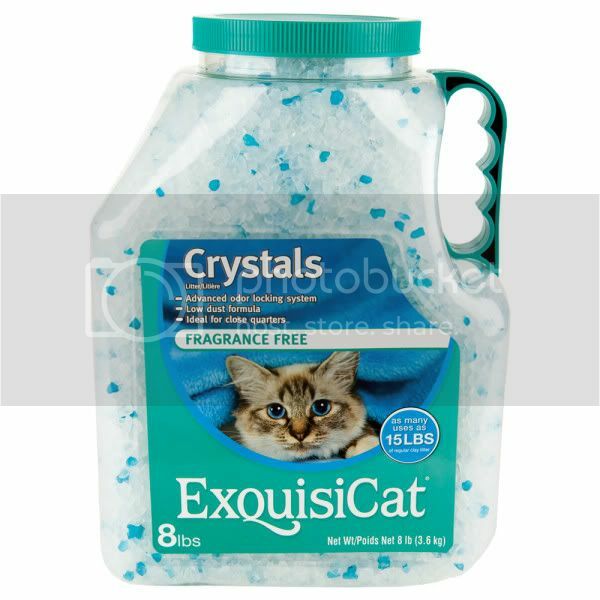 Also make absolutley certain you're using unscented sillica kitty litter. I started using one type that I thought was unscented (the bag mentioned nothing about scent and I sniffed tested it too) but turns out the scent is activated by moisture. Surprise surprise! Just in case anybody is in need of help choosing some kitty litter. Here's a thread that lists some good and bad choices of kitty litter. I thank you every day for your gift of KL Drew! I still have half of the bag you sent!!!! I have been using KL for awhile now and it holds a solid 68.... I haven't touched them since I started months ago. I cracked the rectangular humidification devices that came with the humis, took out the green crap, and replace with KL. That's it, that's all and holding steady since. I am still running a few Paradigms too (not with the KL) as they work pretty well. I have the KL in 150, 100, and 50 count humis. I keep all of the humis in the basement where ambient temperature and humidity stay pretty constant all year. I think this is very important too. Yes, I monitor the temperature and RH outside the humis too. I am NOT kl's biggest fan. I think it makes sense if you need a ton, otherwise I like beads. With that said, my humi has been shut for two months since I'm in training....RH has been 62 the ENTIRE time with me doing nothing to it.